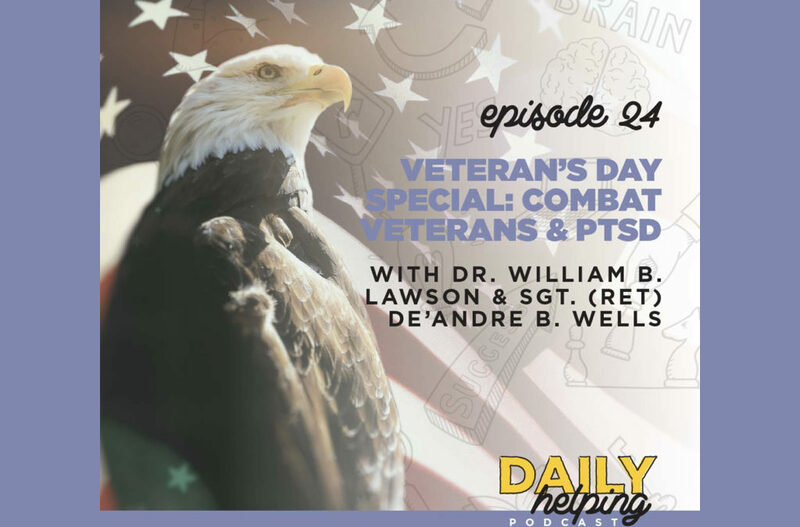 Today we have a very special Veteran’s Day episode, and we’re going to hear from two outstanding guests: Dr. William B. Lawson & De’Andre B. Wells. Dr. Lawson, Associate Dean for Health Disparities at The University of Texas at Austin Dell Medical School, teaches us about PTSD from the standpoint of diagnoses and treatment. De’Andre shares a powerful and personal story about his battle with post-traumatic stress after serving in the middle east, and what he’s doing today to help other veterans keep battling as President of AGX Group And Management Services. De’Andre served as a non-commissioned officer in the United States Army’s 5th Special Forces Group, where he completed three tours of combat duty during the global war on terrorism. Whether you know someone who personally served in the military or not, PTSD is an issue that impacts nearly 25,000,000 people in the United States, or roughly the population of the entire state of Texas. When a person is exposed to an extremely traumatic experience, they don’t just forget about it and walk away. This is more than anxiety, and the symptoms can be very disruptive. People with PTSD may see the world differently, have trouble sleeping, struggle relating to others, and experience autonomic reactivity. The symptoms also persist for months or years. PTSD isn’t specific to war trauma, but PTSD caused by warfare tends to be more treatment-resistant and persistent. Tinina Q. Cade Foundation (Cade Foundation) – cadefoundation.org – The Cade Foundation was launched to help need and infertile families overcome their infertility. They are also focused on equipping active duty and veteran service people with information about different ways to become a parent after infertility, as well as financial support through grants for fertility treatment. I created this episode because, over the summer, I was asked to talk about combat veterans and Post-Traumatic Stress Disorder (PTSD) to help raise awareness about the issue. If there’s anything you’d like to hear on the podcast in the future, reach out to me at TheDailyHelping.com/contact.